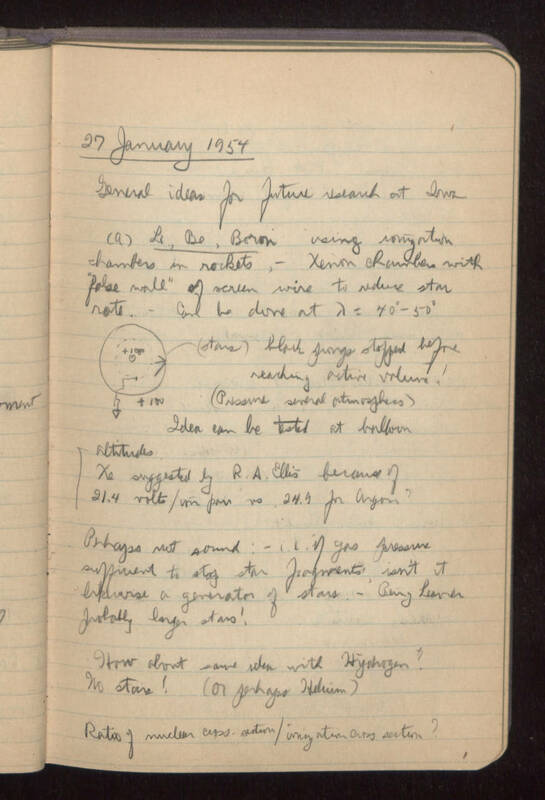 27 January 1954 General ideas for future research at Iowa (a) Li, Be, Boron, using ionization chambers in rockets, -- Xenon chamber with "false wall" of screen wire to reduce star rate. Can be done at (lambda) = 40 degrees to 50 degrees [sketch/picture] drawing of and around globe including: stars, +100, [+10??] [Block? Black?] prongs stopped before reaching active volume! (Pressure several atmospheres). Idea can be tested at balloon altitudes. Xe suggested by R. A. Ellis because of 21.4 volts/cm [pair?] 24.9 for Argon ? Perhaps not sound: -- i.e., if gas pressure sufficient to stop star fragments, isn't it likewise a generator of stars. -- Being heavier probably larger stars! How about same idea with Hyshogen? No stars! (or perhaps Helium) Ratio of nuclear cross-section/ionization cross-section ?